Saratoga, CA - Blessing of the Building Site for a new Temple in Saratoga By the Grace of God, and through the commitment of parishioners and supporters of St. Archangel Michael, Serbian Orthodox Church of Saratoga, California, celebrated the Ground BreakingGround Breaking and the Beginning of Construction of a new Church building on Sunday, June 20th 2010. The day was sunny and pleasant. Our parish was honored to have His Grace Bishop Maxim and Father Stamatis Skliris from Athens Greece along with host priest Fr. Slobodan Jovic. Together they served Matins, Hierarchical Divine Liturgy and Blessing of the building site. Also attending the liturgy was retired priest of San Francisco Fr. Dusan Bunjevic. A great number of people attended the event, but what was important to say is that every face was shining with optimism. Fr Stamatis delivered a powerful message by commenting on the Gospel message about the faith of the centurion, who knew in his heart that Christ had only to say the word, and his servant would be healed. 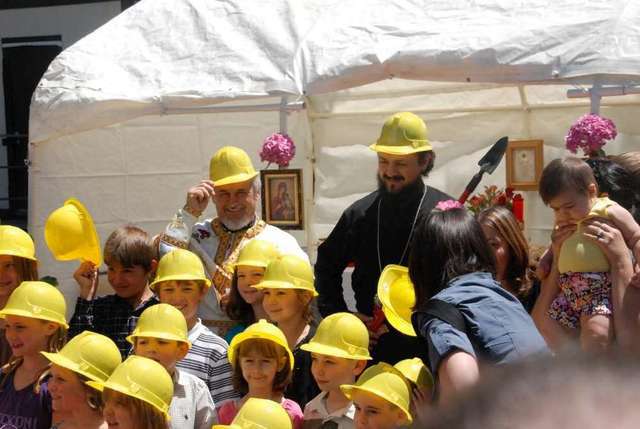 It was very cute to see a group of children together with His Grace Bishop Maxim, wearing ‘hard hats’ and carrying shovels to symbolically start the excavation for the foundation. The Church Hall was very well occupied despite the summer months being usually less attended in our Churches and Social Centers, and the Father’s Day holiday having some people go to their own events and celebrations. During our luncheon there was a slide-show going on about the building of the Church Hall in 1962/3.